Like many banal people before me, I have decided to sell my soul to the devil and make a Kingdom Hearts channel on Youtube, and I've also set up Twitter and will make an instagram for art soon! 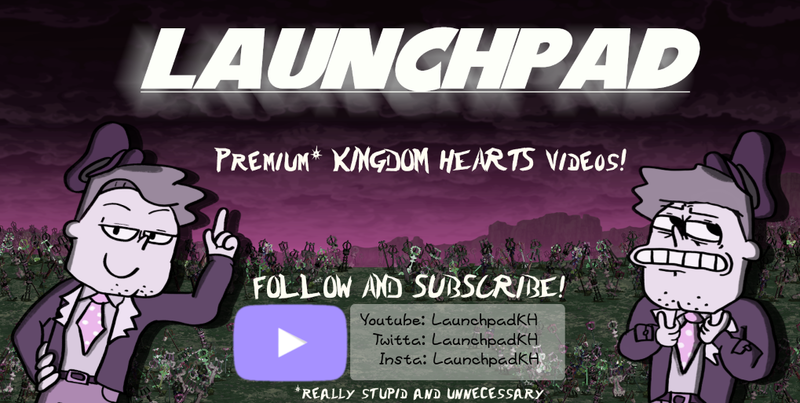 I've thought about this for a very long time; I am extremely grateful for the people on here who have enjoyed my banter and HORRIBLE witticisms over the years, and I wanted a place where I could concentrate my unique point of view on the KH Franchise. I want to make it known that I am trying my best to set up a channel that has both integrity and a good sense of humor. Now, why would you post a link to your Youtube without having any videos up, ya dummy? Well, I figure since the fine people of KHInsider have known me the longest, I'd want to let them know that content is coming, so when my first video (10 minutes long or so) comes out tomorrow or the next day, you can watch it and be excited. As someone who is chronically sarcastic, starting a somewhat serious Youtube channel is a bit of a daunting prospect for me, but your future support can be like a safety blanket for me as I learn to do this stuff. I'd also like to use the channel to show off a little bit of my art, as my artistic side is something I've seldom shared with KHi and that's obviously a big fat mistake-- All videos will have moments punctuated by my mascot (who I've been referring to as 'Launchy' in-script) and will be edited by either myself or my good friend and local forum bandit Ashton69. We've known each other for 10 years and really enjoy working together, so you can see how our styles sync up. I've been informed by the local authorities that my peddling is unlawful and that I should reassess my angle. Following that line of reasoning, I'd love to hear, in the near future, critiques on my scripting and voicing, recommendations for topics (if it comes from here, just know that I will 99% be sure to do it), and maybe even some help from the local KHi kids on amassing art assets like backgrounds and guest-drawn Launchies. The goal is, with everyone's input, to make this into a reliable and honest albeit entertaining space for videos. I'd love to talk about editing with anyone who knows how to do it efficiently because boy I'm slow. To staff: if this is still considered against the rules I'll take what's coming to me-- 100 years off KHi and having my name changed to Launchdad. Before I decide whether or not to close , or delete this thread I want to give you a chance to explain to me how this is relatively related to creative media? The only thing I see is you advertising your YouTube channel which is not allowed, however if you were posting in regards to a music video or some other format that needed critique from our forum members then Iâ€™d let it slide. You can however put your video in your signature as what you did thus far. Side note* going to have to make an advertising rule sticky thread for YouTube channels and marketing for this section it seems like. Before I decide whether or not to close , or delete this thread I want to give you a chance to explain to me how this is relatively related to creative media? The only thing I see is you advertising your YouTube channel which is not allowed, however if you were posting in regards to a music video or some other format that needed critique from our forum members then Iâ€™d let it slide. You can however put video in your signature as what you did thus far. I could buffalo some reason as to how I'm going to make content that requires feedback but in all actuality I just didn't know there was even a rule. My b! Thanks for taking it easy on me. I made my attempt to open up the topic a bit, but I'd love if you could add a "seeking critique" to the topic title perhaps? I don't think I can do that. On things to expect, my first piece of shite is a good place to start. In a video sharing site as popular as YouTube, it's hard to differentiate yourself from every other Joe and Jane out there who throws together a top 10 every week or so (cough cough, Watchmojo cough) and makes bank for it. Your references are timeless (a key point in staying relevant, especially the J Jonah Jameson one) which contributes greatly in the long run. I'd say adding some of your history with a boss can make you stand out a bit more than others. But that's just my opinion, good video overall. (though if I had to make one critique, i'd say using the energetic Blast away Gummi Ship II theme would be a better transition). Thanks a bunch. Yeah, top 10s are definitely not the peak of critical content, but I figured one would be a nice neutral video to establish my style. Something important to me is staying opinionated instead of just being a newsmonger who rips off the already fast KHinsider. Well, it's a good place to start, providing a, for lack of a better word, Launchpad for success. It's harmless, inoffensive and can draw a crowd if there's enough of em. I know i'm guilty of binge watching top 10's consecutively. I did the classic viewbait reaction... Sorry everyone. In the future, do any of y'all advocate this kind of content? I feel like there might have been a better way to cover this trailer, but also wanted to get everything out while the trailer was fresh in my mind. I'll probably get 100 subs and then wander into the forest, craft and whittle a wooden play button, and then get mauled by a bear. So, what kind of videos would anyone even remotely want to see? I'm really down to make anything at this point. React to ALL the npcs in Kingdom hearts, like the prostitute, fat guy and the Agrabah NPCS!!! New vid btw!!! Feat. Ashton69 and another friend of ours. Hey mayne. Just dropping in to say good luck with the channel! I've been considering some different ways to be creative myself. Have fun! So I went unscripted this time around... I feel like I may have spent too much time talking about certain things, but honestly talking voices gets me very excited and I tend to ramble. In the future... Scripted or improvised?